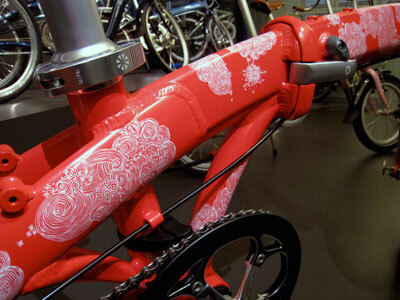 Keiko Itakura approached us, and we decided to collaborate on this bike. It has been in the works for a little over a year, but the results were well worth it. They exceeded everyone’s expectations and we are now trying to figure out what kind of limited production run makes sense. If demand is strong we’ll definitely take that into account. It definitely gives off the “Strong Femininity” vibe, much in the way filigree does with the extremely delicate details taking form from intricately worked metals.We’re working with Keiko now to figure out how to execute the launch and final announcement properly, but we’re happy to have given Bike Hugger reader’s a sneak peak at this special bike. Whatever the final version of the bike is, it’s going to further establish the connection between artists, designers, urban mobility, and bikes.